As well providing the ability to display your tracks to the public using the SoundCloud player widget anywhere on your front-end, this plugin also gives you the control and the ability to manage, upload and delete your SoundCloud tracks via the WordPress administration panel. the ability to upload new tracks from your WordPress administration panel directly to your SoundCloud account. FTP the wp-soundcloud-ultimate folder to the /wp-content/plugins/ directory, OR, alternatively, upload the wp-soundcloud-ultimate.zip file from the Plugins->Add New page in the WordPress administration panel. After you’ve installed and activated the SoundCloud Ultimate plugin you will firstly need to create a SoundCloud app. You will then be taken to the plugin settings page. Click on the link in the “Before Using This Plugin Section” as shown below. 3) Enter the redirect URL which was highlighted in the plugin settings which you copied earlier (see Figure 2). 4) Copy the “Client ID” and “Client Secret“. You will need to paste these in the plugin settings later. 6) Save your app by clicking the “Save app” button. 2) Paste the Client Secret string which you copied when you were creating your SoundCloud app. 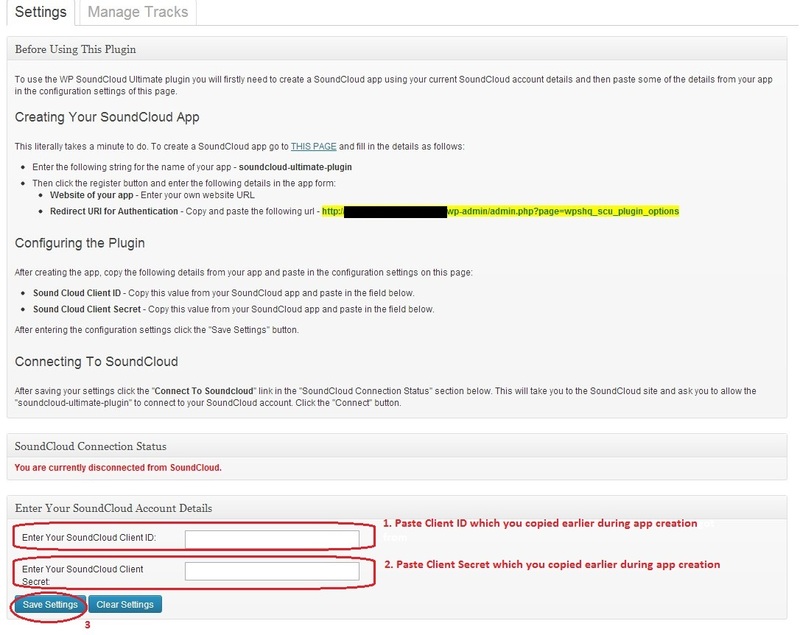 After entering and saving your plugin settings the final step in the configuration of the plugin is to connect to SoundCloud by allowing the app you created to have access to your SoundCloud account where your tracks will be stored. To do this you simply click on the link in the orange box as shown in figure 6. Click the “Connect” button to complete the final step. After being redirected from soundcloud you will see a “connected” status as shown above. 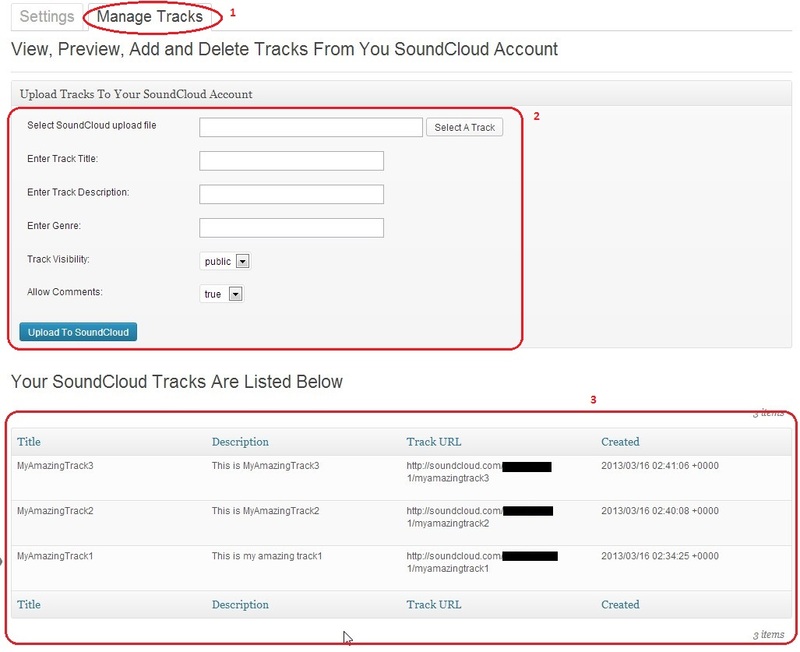 To upload, view, preview and delete tracks to/from your soundcloud account, click on the Manage Tracks tab as shown in Figure 9. The tracks which you currently have in your SoundCloud account will be conveniently displayed in a table as shown by “3” in figure 9. 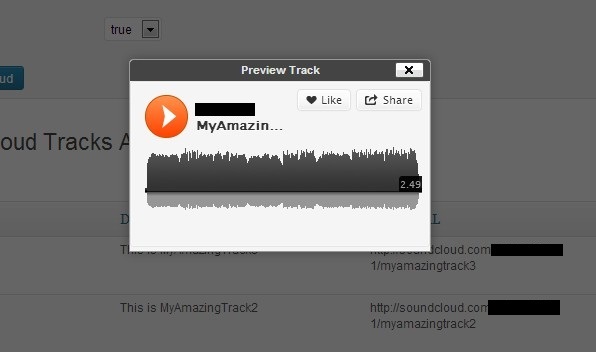 To delete a track from your SoundCloud account, simply hover over its title and click the “delete” link as shown in Figure 10. 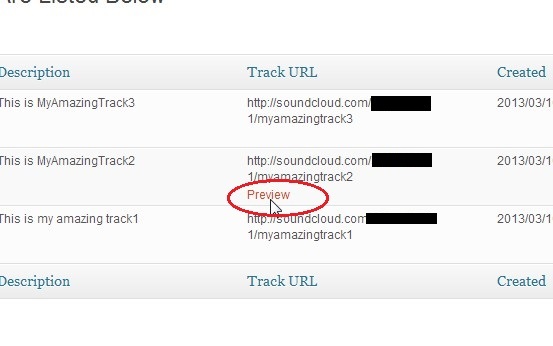 To play (or preview a track) you need to hover over the “Track URL” and click the “Preview” link as shown in figure 11. Note that you need to specify the SoundCloud URL of your track. You can get this value easily by copying it from the plugin “Manage Tracks” page in the admin panel. 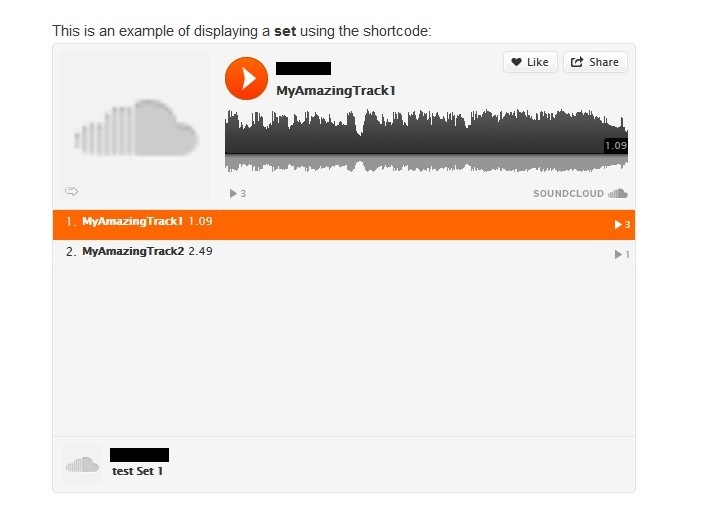 To display a SoundCloud player for your sets or playlists on a post, page or widget, you use the same shortcode as in point 3 above except that you would set the track parameter to be the URL of your set. 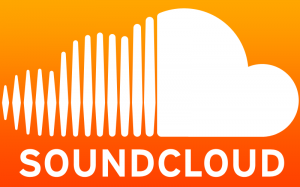 You can get the set URL value from your SoundCloud account. I’ve found the SoundCloud Ultimate Plugin to be very effective especially for those of us who want to upload and view our soundcloud tracks without leaving our wordpress site. Your plugin is very usefull , thank you for creating it. I use it on my website and i wonder if I can upload tracks in bulk ? Currently bulk upload of tracks is not possible. I will look at adding such a feature in future. I will test your plugin, hope it still works. When i connect my soundcloud, I am only getting the latest 50 songs when i have way more than that. is there a limit to the numbers of songs i can manage from wordpress? As far as I know there should be no limitation regarding the number of tracks. Hi. Your plugin is awesome. Would it possible to get the soundcloud editing functions in the front end rather than the wordpress admin panel. So display in the front end for logged in users basically. Hide for not logged in people. I see you solve a LOT of problems, so I also have a question for you. My name is Maurien and I just installed Soundcloud Ultimate. I’m a musician so what better way to share your music via Soundcloud. SoundCloud Ultimate Error: Could not display your SoundCloud track – Error code (401). Can you help me? I already tried it 5 times over, I tried it with different songs and off course I googled first. But there’s a lot that i do not understand. I’ve installed and triple-checked all the different settings using this plugin but every time I try to connect to the server the plugin in WordPress gives me a 401-error. I’ve retried with a fresh made application but the plugin will still give me same hassle. Any idea what might be wrong? SoundCloud Ultimate Error: Could not display your SoundCloud track – Error code (302). Which of version of PHP is your server running? Can you please contact me via my form so I can send you an updated zip file of this plugin for you to try? However it has been working flawlessly for a few weeks : May you please help ? – Go to this plugin’s settings tab and first take note of the client ID and client secret. I seem to have this same problem, yet using a new soundcloud application, re-installing the plugin nor clearing the settings help. I have the same problem and it does not help to clear the settings and connect again. Really need for this to work so please help! Firstly check your server logs to see if there are any entries related to this issue. If so please let me know what they are. 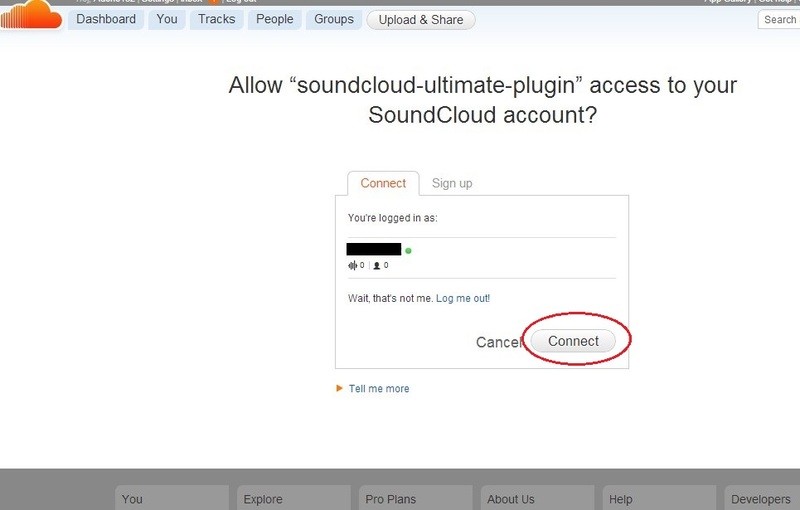 2) Log into your soundcloud account and delete the app you created previously which was used to connect this plugin to soundcloud. 3) Go back to the soundcloud ultimate settings page in the WP admin panel and follow the instructions and create a brand new soundcloud app and configure the settings as stated in the instructions on this plugin’s settings page. As a novice WordPress tinkerer I’m not sure exactly what to do. Can anyone help me? I want to make the player size 300×250 pixels. This is a great plug in, thank you! But when I view it on mobile, it reads “SoundCloud Ultimate Error: Could not display your SoundCloud track – error code (504)”. Which mobile device have you tested it with? I tried a quick test on my iPad and my track seems to play ok.
Fail to see a playback count visible on player. Only visible via SC Ultimate settings> Manage Tracks. Very nice plug in BTW. Playback count display for the player widget is currently not supported. I keep getting this error SoundCloud Ultimate Error: Could not process the request – Error code (0). when im trying to connect with sound cloud. I have released a new version of the plugin which will hopefully resolve your issue. I’m running the new version 1.4 but still am getting SoundCloud Ultimate Error: Could not display your SoundCloud track – Error code (0). Url to sound cloud audio track is tested in 3 browsers. 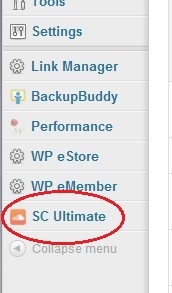 SoundCloudUltimate connects and is configured/connected via WordPress interface. Are you able to play the tracks when previewing in the SC Ultimate “Manage Tracks” tab? I can’t get my pre-existing soundcloud tracks into the manage tracks forms or list. Can the plug-in recognize tracks already uploaded to soundcloud or does the plugin assume that you uploaded the tracks via the plug-in? Yes the plugin will get all tracks which are currently in your SoundCloud account. So just to confirm, are you seeing the message “You are currently connected to SoundCloud” in the settings page? When you hit the “Refresh Data” button in the Manage Tracks tab what do you see – is there any error displayed etc? Why can´t i heard the song from shorcode post?? Are you saying that the soundcloud player is displaying but you are hearing no sound? Can you post a link to the track you are referring to so I can take a look? Any help with how to add width and height would be greatly appreciated. Have you tried wrapping the shortcode inside a html “div”? Then you can apply some CSS to the class called “my-soundcloud-widget” to get the sizing you wish. I am trying to resize my soundcloud player and don’t really understand what you mean by applying some CSS to the class! Can you explain at all please? I don’t know what i’m doing wrong. Everything goes right until I am at ‘click the connect button to complete the final step’. The app says: Soundcloud Ultimate Error: Could nog process the request – Error code (0). For a image: [http://www.renereche.com/temp/image.png]. Showing the error SoundCloud Ultimate Error: Could not display your SoundCloud track – Error code (302). Check with your host provider and ask them if your account has safe_mode or open_basedir enabled in php.ini? These need to be disabled and if either one of these are enabled it will affect the correct operation of the cURL functionality which this plugin needs to operate correctly. Many thanks for the advice and for the awesome plugin! SoundCloud Ultimate Error: You need to specify a track URL in your shortcode. Your shortcode has a mistake in it. You are missing the closing double-quote. Alternatively, you can remove the double-quote just after the track= part. In my page (http://blog.discovolanterecordings.com/2014/?p=5) I can view only one track. So I think that SC cut the url and shows only that track. I’ve debugged your plugin (I’m a developer) and I didn’t found any bug, until it return the html code that has the bug. Any thoughts? I just tried a similar test and I was able to see the same problem as you. I then realised that in my playlist I had only one track which was “public” and the other was “private”. Hence the playlist shortcode was only showing the “public” track and not the “private” one. After setting all tracks to “public” I then noticed that the shortcode was displaying ALL tracks in my playlist. I hope this helps you with your issue. Hi there. Thanks for the app! I saw a similar question posted earlier, but haven’t been able to resolve this problem. I’d like to display the player in different size. I placed the shortcode in a div with a unique class that is the size I want, but the player doesn’t resize–it just overflows out of the div. Right now I’m having to use an “overflow=hidden” to keep it from flowing out of the div, which makes it impossible to see the tracking slider or really much of anything besides the play button. Is there anyway to get the player to resize into a more compact view? Thanks! Can you please post a link to an example of a player widget which is having the resize problem so I can take a look at the CSS? I followed all the instructions in the plugin, set up the app in soundcloud. No matter what I cannot get plugin to connect to the app. What error code are you seeing when trying to connect? I don’t see een error code. after connect on soundcloud redirected to the wordpress admin but still You are not connected to soundcloud. In the “SoundCloud Connection Status” section there should be a button/link called “Click Here To Connect To SoundCloud”. Did you click it? If not, click it and then you should be able to connect. Yes , I did. Then I directed to Soundcloud. Cliked the connect button. Then I back linked to my wordpress plugin page. Still disconnected. I did peter. After that I was redirected tot Soundcloud . clicked on the connect button en then redirected to the WP plugin page. Stil message “You are currently disconnected from SoundCloud.” is shown. tried it a several times…..
2) Login to your soundcloud account and delete the souncloud app and create a brand new one. 3) Then go back to the plugin and start the configuration again. Be careful to read the instructions closely and make sure you copy and paste the correct client ID and secret from your soundcloud account. I’ve done several tests on two separate sites and I don’t seem to have any issues connecting to soundcloud. What type of site hosting plan do you have: shared, VPS, dedicated server? “SoundCloud Ultimate Error: You need to authenticate your connection to the SoundCloud API. The first thing I would advise you to do is to double check that you have entered the correct “Client ID” and “Client Secret“. 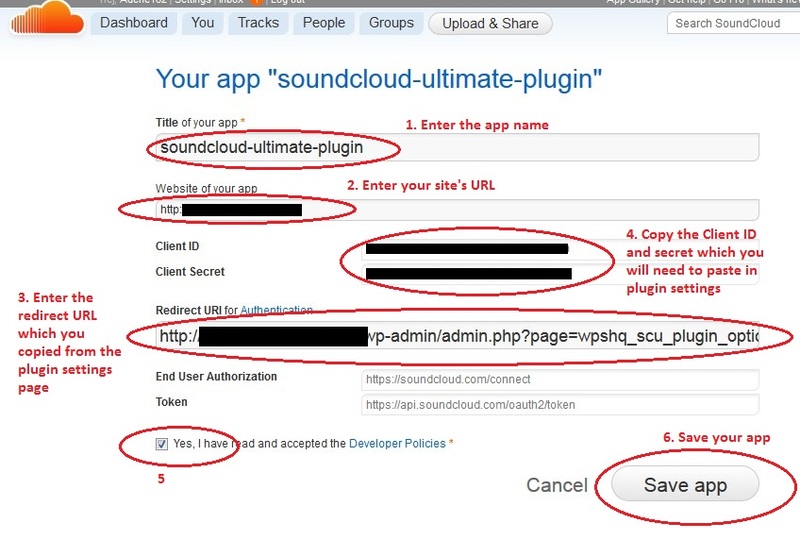 If these are not correct then the plugin will not be able to authenticate with the soundcloud server. I’ve checked the URL, which comes straight from my “Manage tracks” on the dash, I’ve tried with https also, still same error. The track is definitely there (it’s a private sound, so the following URL shouldn’t work for you, but works fine for me once I’m logged into SC. Is there a way to display private tracks using this plugin? I’ve used other plugins where I just needed to specify the “secret token” from soundcloud. Is there any way to do that with this?? I am just about to release a new version which will display private tracks too. Quick question. It says “the ability to upload new tracks from your WordPress administration panel directly to your SoundCloud account”, yet unless I am mistaken it seems to go through the WordPress Media Library – thus bumping into upload & storage limits. Yes, I’m having the exact same problem. My tracks are bigger than what is allowed by the media library … and what’s the point of uploading the track twice? and from now on whenever a comment is added I get 4 emails with the same comment. I tried this plugin as I thought it had everything I needed. I followed all instructions but like others on this page I received the 302 error. I tried all solutions listed to no avail. I had to uninstall it and try another plugin. If ever a solution to this problem becomes available I will go back to it. Hi, after installing you’re plugin with a custom theme, it seems to displace an entire div from the header. This is before I have linked my SC account or started any setup at all. If I deactivate the plugin this disappears. Are you referring to the front-end of your site? If so, can you post a link to a page where the problem is occurring? Partway through making a website. Is there anyway to have tracks autoplay with this plugin? I’ve just checked the soundcloud API documentation and it appear that it is possible by setting a special parameter (auto_play). I will make an update of my plugin to include this functionality hopefully within a week. Does anyone know if there is documentation on style the SoundCloud Plugin for WordPress? I own my own Dedicated Server and I can ensure you that PHP Safe Mode is off. Yes I am running in https:// by default. My website is secured with a GeoTrust Quick Premium SSL Certificate. I’m running a CentOS 6 Server with Plesk 11.0.9 installed as a CPanel. I believe this should give you enough information. I would like to know what is causing this as I need soundcloud functionality for my website. Now after further digging into your code I opened up the Soundcloud.php file and saw that the exception is thrown depending on a bool set by a function called _validResponseCode which simply uses a regular expression to catch any HTTP codes within the 200 range. Now as far as I am aware, a 302 HTTP code means Found which means it has the data. So unless I’m greviously mistaken shouldn’t the app work? Question: I have seen a lot of SoundCloud plugins now and they all look great but from studying their features I cant help but wonder if what i’m looking to achieve is actually possible. I am not a musician nor do I upload my own personal sounds on to my SoundCloud page. As a blogger I use SoundCloud to discover new music and use the “Like” and “Repost” buttons to create a stream within my SoundCloud profile which has the list of all the songs I have “liked” and “reposted” as the months go on, which when played continue to play through each song on the list. What I was wondering was, is there a plugin or a way that I can integrate SoundCloud so that a widget/plugin on the sidebar of my WordPress site worked in the same way, that didn’t play my sounds but the sounds I have “liked” or “reposted” like they do on my SoundCloud profile? Someone put me out of my misery! Unfortunately, i don’t understand the code @ line 919 (I think it’s some reference to another “place”). Further more the authorization for the folder “Soundcloud” is set to 755, for the soundcloud.php, the exception.php and version.php (the last two files are in the soundcloud-folder) are set to 644. Does it help somehow? Or does my problem not concern this settings? Can somebody tells me what to do or what the error code 302 means? According to the error you are getting I still think the problem lies with your server settings. Looks like “safe mode” is enabled and you should talk to your hosting provider to disable this if possible. This is great plugin so many thanks! I’ve managed to set everything up and working, I’d just like to be able to customise the colours of the player, in the same way you can from within soundcloud when setting up widgets. I have a friend that has a Membership site and is selling his recordings from SoundCloud. All the tracks and sets are NOT public. Yes, the SoundCloud Ultimate plugin will display the HTML5 soundcloud player. Hi we are currently experiencing very slow load times of our soundcloud tracks using this plugin, the page can take up to 5 minutes to load? And sometimes does not load at all, How many tracks in total would you recommend having on a page? 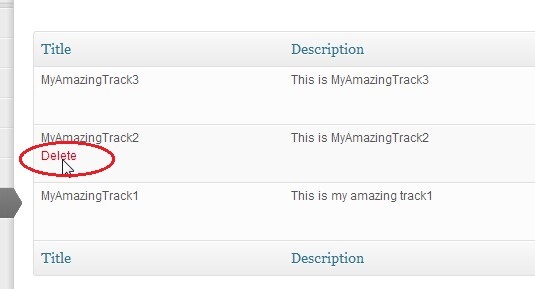 Are you referring to the amount of time it takes to list the tracks in the plugin’s “Manage Tracks” tab? How many tracks do you currently have in your SoundCLoud account which you are trying to view via this plugin? I suspect that the problem may lie more with the type of browser than anything else. For instance FF and Chrome are horrendously slow when trying to load your pages. However, Opera is amazingly quick – (try it for yourself!). In meantime I will investigate to see if anything can be done to speed things up. Id like to add on my wordpress a seperate page just for the user to hear all my music. I also want to be able to select, ” classical” and all classical to show up. Exactly as well as selecting” Bethoven” and all of his tracks will show up. The soundcloud ultimate plugin doesn’t really do what are you asking but having said that…. You can group your music into playlists within soundcloud and then display the playlist on one of your wordpress pages by using the shortcode from the soundcloud ultimate plugin. Hey there! Any chance you know how to make the player a different size to fit in smaller window? Yes you should be able to wrap the shortcode into a div tag and you can set the width and height to whatever you want by using some simply css code . Alternatively if you wish to display the play in a sidebar widget just put the shortcode inside a “text” widget and the soundcloud player will automatically conform to the size of the of the widget containing the player. sorry, i cant find those shortcodes, im a beginner. Can you reply a shotcode where i can change the height and width? thanks! I have a related question: when I put the shortcode in a “text” widget, it displays the shortcode instead of the players. How do I get a sidebar widget to display the players?? I will release an updated version of the plugin in a day or two which should solve your problem. The “settings” page and “manage tracks” pages on my site are completely blank after installation. What is that about? How do I set it up? In most cases the cause of a “white screen of death” in WordPress environments is due to an exhaustion of memory. You should check your hosting server logs to see if there are also any errors being logged which might share some more light into the problem. If this doesn’t fix it you should contact your hosting provider to see what they can do for you. Thank you for the plugin – I hope I can get it to work. The issue you are seeing is actually related to your hosting server. It appears that your server has a feature called “safe mode” which has been enabled. This feature is something which was present in older versions of PHP (ie, before v 5.3.0). Safe mode is deprecated in PHP 5.3.0 and is removed entirely from 5.4.0. So in summary in order to fix this error you can ask your hosting provider to disable “safe mode” which must done in the PHP ini file, or find a better hosting provider with a more up to date PHP version. I have the same problem (asked before, but can’t find the post anymore) and my host already switched the safe mode to off. But the problem still exist. I also copied the song- and set-code directly from soundcloud. doesn’t bring any solution… are there some other ideas? thx for help! What sort of errors or issues are you seeing? Hmmm, I’m having the issue on a PHP 5.4.13 server. What is the exact error message you are seeing? Could anyone please tell me how to fix this? To display the SC widget for sets all you need to do is to set the “track” parameter in the shortcode to be the URL of your set. Nevermind I have resolved the issue. I think I’m having the same problem regarding the “The track you specified in the shortcode does not exist in your account” error – just wondering how you managed to resolve it in the end?